Get ready to hit the lake this summer with our great looking 2010 Ford F-150 Lariat SuperCrew 4X4 shown off in Silver Metallic! Powered by a 5.4 Liter V8 that offers plenty of power while paired with a smooth shifting 6 Speed Automatic transmission to maximize towing. Inside our Lariat, enjoy upscale seating designed to hold you in place with comfort. Enjoy easy to read gauges, heated and cooled leather seating, power everything, incredible AM/FM/CD audio, along with space to carry what you need. Security is emboldened into every Ford, and this F-150 starts with ABS, 4-Wheel Disc Brakes, Frontal Driver and Passenger Airbags, and Daytime Running Lights to name a few of the safety features. Characteristics that have made the F-150 a winner, namely power, safety, and reliability, are well-entrenched in this one. Print this page and call us Now... We Know You Will Enjoy Your Test Drive Towards Ownership! 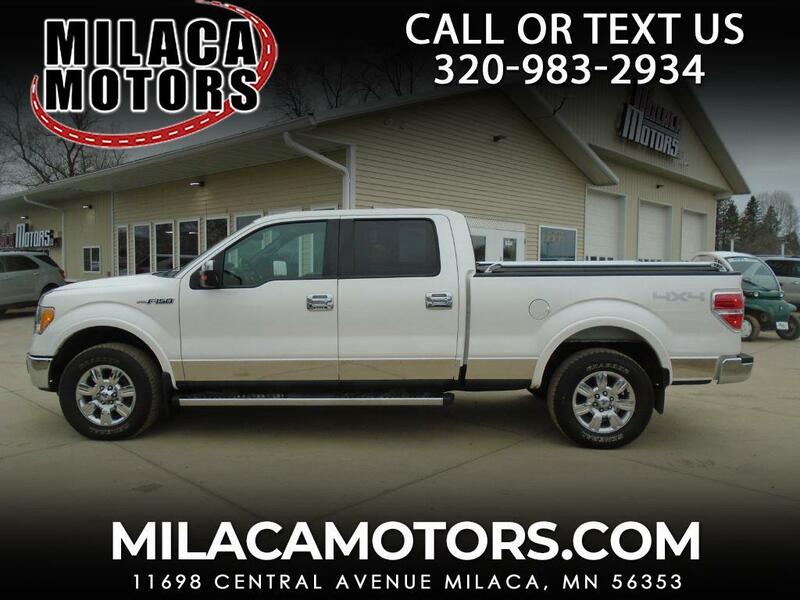 Visit Milaca Motors online at www.milacamotors.com to see more pictures of this vehicle or call us at 320-983-2934 today to schedule your test drive. Message: Thought you might be interested in this 2010 Ford F-150. Milaca Motors is a family owned & operated used car dealership dedicated to honesty and integrity in business! We have the best used cars in Milaca MN at affordable prices. Milaca Motors has great low interest loans available for most folks and special financing for the credit challenged! Same day service available - Drive Home Today! Get pre-approved today with our secure, online Credit Application or fill it out and bring it in. Milaca Motors is a used car dealer servicing the greater Mille Lacs county and Stearns county areas in Minnesota. This includes Princeton, St Cloud, Elk River, Onamia, Cambridge, Mora, Little Falls, and Minneapolis/St Paul. We have a wide variety of cars, trucks and SUV's for sale. Call or Come on by for a Test Drive Today!